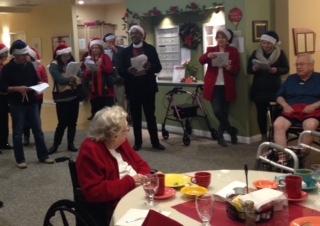 Members of the Rotary Club of Mission San Rafael joined fellow Rotarians from other Marin Clubs to sing for seniors at Aldersley Retirement Home and The Rotary Manor. We were led by professional singer, Rotarian Noah Griffin, who helped us perform to a high standard. We even helped celebrate the last night of Hanukah with one of the residents. Lots of smiles and Thank You's to go around.